and more musicians who play the organ. New hymn arrangements for brass and organ. 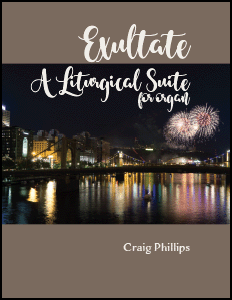 We have a useful series of organ publications in print, including collections and solos for the Advent & Christmas, Epiphany, Lent & Easter, and Pentecost; pieces useful for weddings or funerals; a popular series of Hymn Intonations, Harmonizations & Preludes by the likes of Richard Proulx, V. Earle Copes, Alfred V. Fedak, and Austin C. Lovelace; recital literature for the more venturesome organists, or works with other instruments. We even have an instructional video, The Art & Craft of Playing Hymns, that will inspire your hymn playing (it's had some great reviews). You can also view our organ publications by composer, title, or hymn tunes used. We also have some helpful articles for organists that appeared in Selah's newsletter Music in Worship, and you can read them online at your leisure. Selah is looking for more quality piano solos useful for worship, but check out Robin Nixon's When Jesus Wept and Russell Schulz-Widmar's Procession.